Cnr. Birdwood Avenue & Dallas Brooks Drive, Melbourne (near the Royal Botanic Gardens and the Shrine). Melway map ref. 2L A1. La Trobe Society, Friends of La Trobe’s Cottage & National Trust members free. Discover Melbourne’s rich heritage in the grand State Rooms of Government House and in the simple yet elegant La Trobe’s Cottage. Tours are available all year by appointment on Mondays and Thursdays, subject to the availability of Government House. Maximum of 30 people. 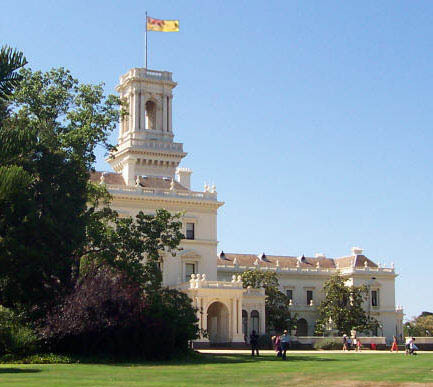 The tours start at the Government House Gatehouse, Government House Drive, at 10.am (arrival by 9:45am). 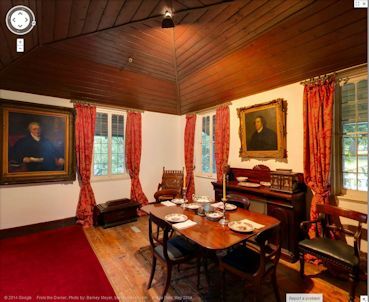 A group tour of La Trobe’s Cottage only may also be arranged, Monday to Friday. For booking, contact the National Trust: email bookings@nattrust.com.au, or phone (03) 9656 9889. Note: As Government House is a working residence, tours may need to be rescheduled or cancelled. Full Names and Photo ID are required for entry. Clicking this image will take you to Google Street View. To move inside the Cottage, click on the arrow by your mouse when it is pointing in the direction you want to go. Drag your mouse across the picture to look around. 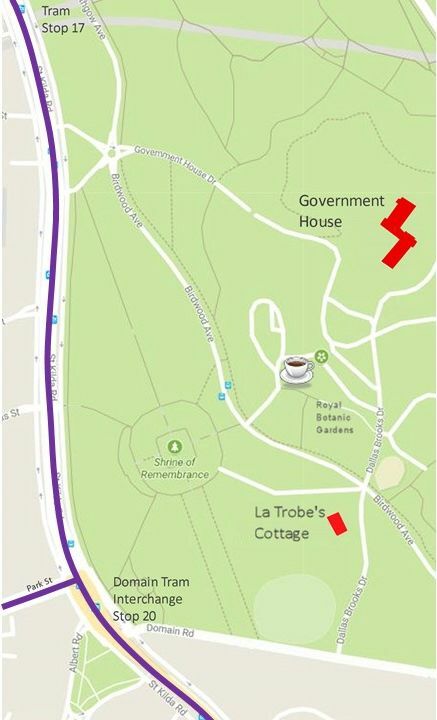 From the City: take any tram along St Kilda Road (except Route 1) to Park Street, Stop 20 and walk across the park. Alternatively, take Tram No. 58 from William Street/Kings Way to Wells/Park Street, Stop 119, and walk across the park. From South Yarra Station: take Tram No. 58 to Wells/Park Street, Stop 119, and walk across the park. 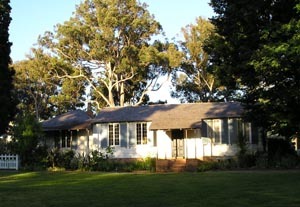 La Trobe’s Cottage is located on the corner of Birdwood Avenue & Dallas Brooks Drive. This is close to the Shrine and Royal Botanic Gardens. Parking in neighbouring streets is free on Sundays.